We believe that architecture should serve as a reflection of the people that inhabit the space and we embrace the unique design challenges implicit in each project in pursuit of that ideal. The focal point of this kitchen addition is a 12' long custom built reclaimed wood island that was conceived both as a work surface and as a dining table for large gatherings. A custom metal sash window wall takes advantage of the southern exposure and the additional ceiling height bathes the space in natural light. The refined modern design combines thoughtful touches of vintage character with practical everyday elements that reflect the owner's lifestyle. Main Kitchen Line with Marble Backsplash and Open Shelves with Recessed LED lights. Electrical receptacles that sit flush with the surrounding surface, without visible cover plates. This historic home in Summerhill, owned by design professionals, called for a new kitchen, outdoor space and master bathroom. The outdated kitchen functioned poorly, lacked views to the backyard and captured very little of the natural light. The owners desired as much light as possible as well as a landscaped deck with seating to enjoy private space. The solution was custom designed windows featuring an oversized door in mahogany, providing views to the inviting, newly constructed backyard retreat. A modern kitchen was designed with clean lines, including access to the basement which is concealed in the millwork. 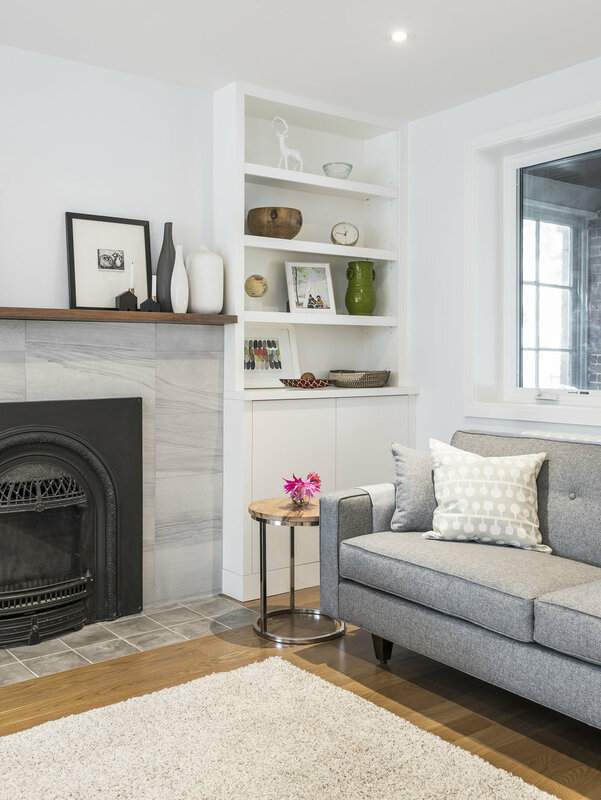 This 100-year-old High Park residence required a complete ground floor overhaul to fulfill the owner's desire for a bright, modern and functional home. Prior to the renovation the house was dark and cold, with a cramped and dysfunctional kitchen and an unused addition at the rear. Studio Z created a luminous and functional space and increased energy efficiency by using high performance windows and doors and insulating all exterior walls. 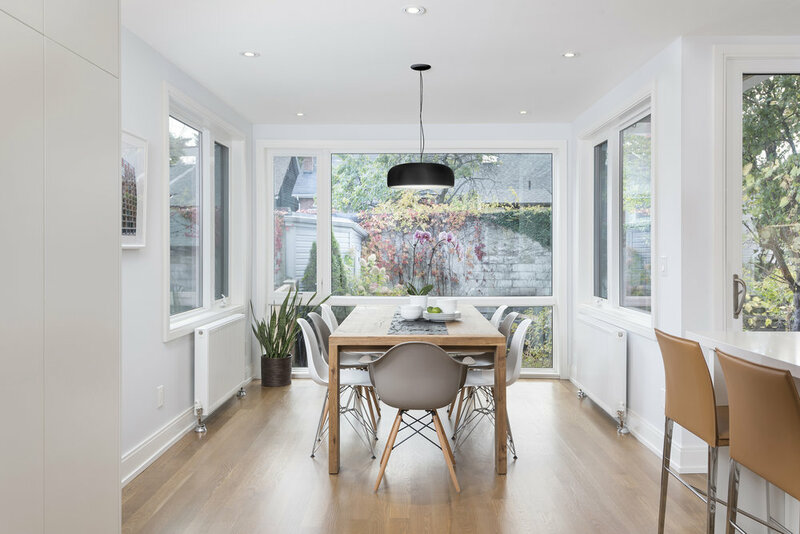 The architect's vision of achieving a clear line of sight from the front entrance through to the rear glass-enveloped dining area created a fresh and welcoming atmosphere for the family of four. The new Dining and Kitchen area with views and access to the south facing backyard. 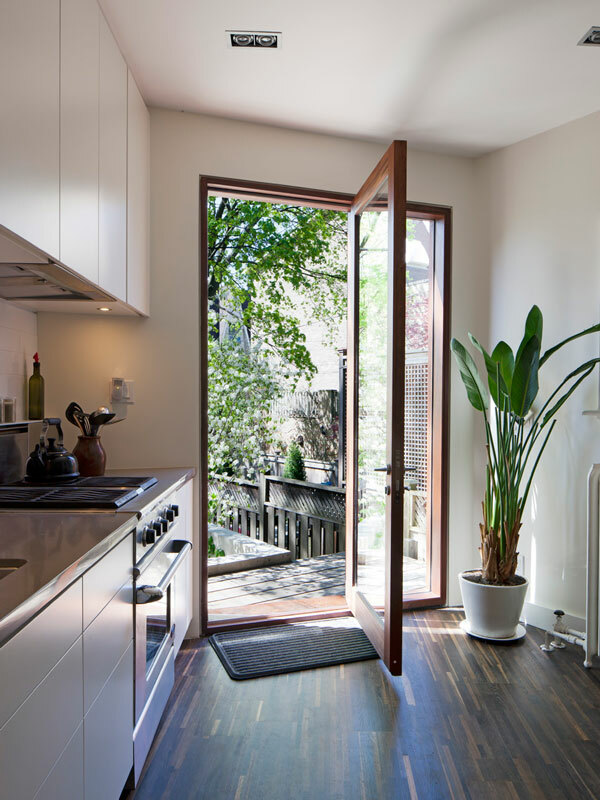 Relocated kitchen with direct access to exterior deck has a simple and elegant aesthetic. The new ground floor layout is open yet still maintains defined living spaces. Built-in shelves display cherished items. A light filled south facing Dining Room with new windows on all sides is the focal point of the Ground Floor. A new island accommodates quick meals for a busy family . The new stair at the front of the house provides a landing that serves as a bench to get ready when coming and going. New built-in bookcases flank the existing fireplace. Conceived as an adult retreat, this contemporary third-storey addition replaces the former attic which was too low to provide usable space. Studio Z designed a luxurious, private sanctuary by stripping away the existing roof and building a taller one complete with cathedral ceilings rising to 11 feet. 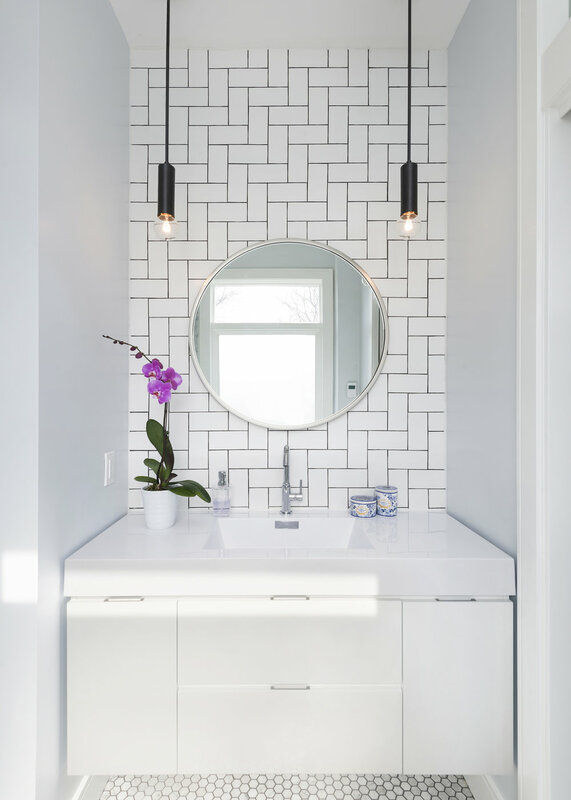 The loft style space includes a large bedroom with natural light on both sides and cross breeze ventilation, a walk-in closet and a bright and inviting ensuite bathroom. 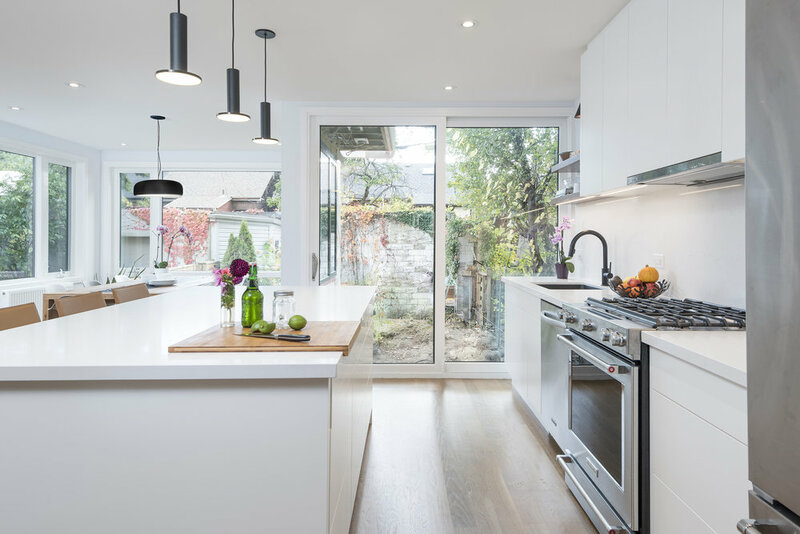 Located in Toronto's Parkdale area, this large 125 year old semi-detached house was once divided into several apartments. 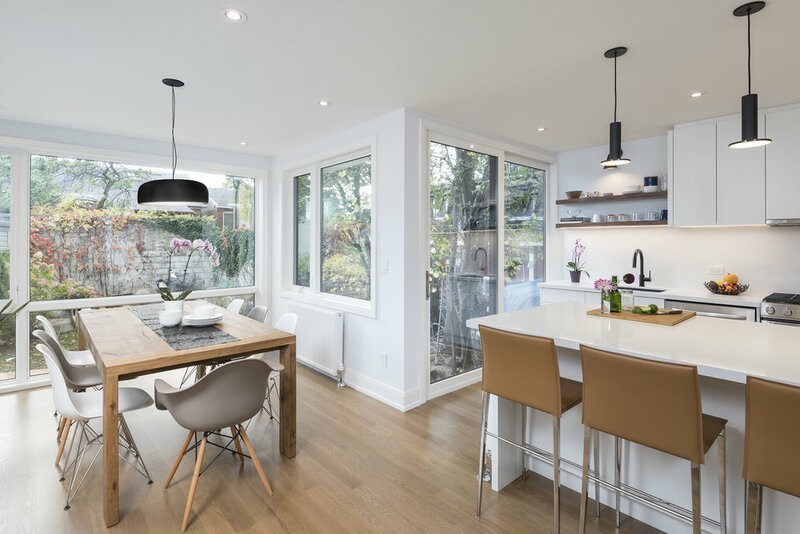 The home was returned to a single family residence claiming enhanced functional and bespoke features including sound proofing and cleverly designed built-in cabinets throughout. The formerly dark and partitioned home is now bathed in natural light and boasts a welcoming and open ground floor living space. Designed for a couple who love to cook and entertain, the kitchen was relocated to the center of the home to become a focal point for both daily living as well as special gatherings. This captivating space was achieved by delicately blending a modern aesthetic with the original Victorian character. The design for the garage and sauna was inspired by Scandinavian style and their love for wood-burning saunas; housed in simple, rustic outbuildings. The beautiful charred wood cedar siding, accomplished on site by the contractor through a process called shou sugi ban wood, (burning the individual planks of cedar) provides a unique and wonderful texture and finish. The Scandinavian theme extends to the roof where pine tar, a natural preservative often used on boats, bridges and wooden buildings in Scandinavia, was applied to each individual shingle on site to produce the traditional tarred shingle finish. 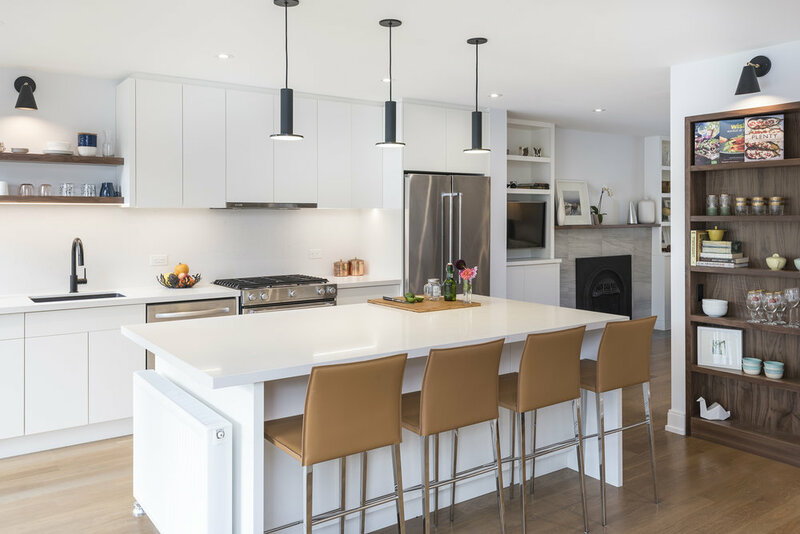 The owners of this suburban home desired a new kitchen to replace their outdated 70's kitchen with California ceiling, fluorescent lighting and worn cabinetry. They aspired to infuse the kitchen with Tuscan colors and treasures collected over the years during their Italian travels. Studio Z layered colors, textures, and materials in the kitchen layout and designed space for cherished items. The overall effect is a very calming neutral setting for cooking, relaxing and family gatherings, with playful jolts of colour. The renovation of this upstairs bathroom required the addition of laundry facilities which could be concealed from view when not in use.